Spirograph was invented by Denys Fisher in the early sixties. Spirograph's geometric patterns were beautifully in tune with the swinging sixties. Like the Lava Lamp, the timing of its launch in 1965 was perfect. Spirograph won Toy of the Year and was the top selling toy in America in 1967. It is still available today, as MB Spirograph in the UK and Hasbro Spirograph in the US. Denys Fisher was an engineer who supplied precision components to NATO in the early sixties. His passion though, was a Victorian idea for creating patterns using cogs and wheels. He tried to improve on what the Victorians did using Meccano gears during the Christmas break of 1962. However, his first attempt was unsuccessful. His original idea came whilst he listening to Beethovens Ninth Symphony. His inspiration was to use a series of perforated cogs and racks, into which a pencil could be inserted. Denys Fisher's original intention was to market Spirograph as draftsman's tool, but he later decided it would sell better as a toy. Spirograph first went on sale in 1965. Its geometric and swirling patterns chimed perfectly with the Op Art and geometric designs that were popular in the 60s. It also fitted in fantastically with the psychedelic patterns of the later swinging sixties. 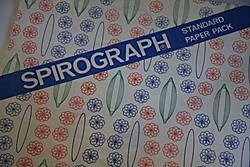 Spirograph was featured on the BBC children's programme, Blue Peter, and very soon was selling in large numbers. In the first four years Spirograph took the turnover of Denys Fisher's company from 30,000 to 3 million. 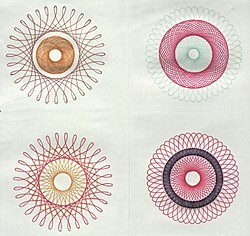 The original Spirograph had a series of large and small cogs, wheels and racks. It was supplied with four coloured pens in black, red, blue and green. You could buy special Spirograph paper for drawing on. You placed the special paper onto a corrugated cardboard base. Then pinned one of the large wheels or racks to the paper, using drawing pins supplied with the Spirograph. Then one of the smaller geared cogs was lined up against the larger cog or rack and a coloured pen was inserted into one of the smaller cog's holes. You then turned the smaller cog, using the pen, which then drew the Spirograph pattern. A huge variety of different patterns were possible. The instructions gave you some examples, but many more combinations could be produced with experimentation. Spirograph was a very creative toy. Denys Fisher's creation was loved by adults and children alike. Newspapers and magazines recommended it as an marvellous toy for older children. Spirograph won the Educational Toy of the Year three years running from 1965 to 1967 and became Toy of the Year in 1967. The original version cost 1 15s 6d [about 23 in today's money] from Hamley's in 1966. Spirograph was a top selling toy in Britain and America. It became the number one selling toy in the US for Christmas in 1967, beating another British company, Lesney, whose Matchbox cars, were previously America's top selling toy. (Now I know why Lesney made so many American cars). Spirograph was so successful that it started to influence the world of fashion. Op Art and geometric prints were already popular, but Spirograph patterns appeared on evening dresses in black and white printed crepe by John Cavanagh in 1966. Denys Fisher sold his company in 1970. It was eventually bought by Hasbro. Spirograph is now manufactured by MB Games for the UK market and Hasbro for the US market. The best place to buy old versions of Spirograph is eBay. There is a lively trade in Spirograph sets from the 60s, 70s and 80s. A new generation can still enjoy Spirograph. The new version has some new gears in different shapes. It is manufactured by MB Creative as MB Spirograph for the UK market. In the US there are two versions available: Hasbro Deluxe Spirograph and Hasbro Travel Spirograph. Some reviews on Amazon of the 'Spirograph Classic' modern version of Spirograph suggest it is not as easy to use as the original. However, the MB Spirograph looks a different product. Please let us know if you have used any of these new versions using the comment form below. Can you buy Spirograph new? The new version of Spirograph seems to be quite difficult to get these days. There are several alternatives, but the Hypotrochoid Art Set, right, is closest to the original concept. There is a Wikipedia article see - Spirograph on Wikipedia. There are two Facebook groups about Spirograph, Spirograph and DUDE...I love spirograph. "I am not convinced Denys Fisher was the original inventor of the toy known as Spirograph. His plastic templates were original and he probably did invent the name Spirograph." 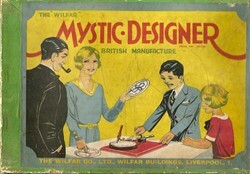 "However, in the thirties there was a toy called 'Mystic Designer' which produced virtually the same results. It was made by a company called Wilfar based at that time at Wilfar Buildings, Liverpool 1. The original box it was in had on it a British Provisional Patent Number of 36158." "I recently bought an old 1980's set in a charity shop for the princely sum of £2.50. It is unopened with the original plastic wrapping still on it, is it worth anything?" I got 2 different sets as a child. One I think was a copy, it was called "Create-a-graph" and contained 15 wheels, 4 odd shaped gears, 2 rings, 1 rack and 1 swing bar. I've tried to find the manufacturer but there isn't a clue to be found. Later I got a Parker Spirograph set with 18 wheels, a frame and a ruler. The parts of these two were interchangeable, same teeth size. Thankfully I kept both and they are nearly complete still. "When I grew up in the 1950's - 1960's I played with a "Hootenanny" that had belonged to my much-older sisters - a heavy red metal base about 9 inches square with a crank at the corner that turned a turntable about 7 inches in diameter. There were two other mini-turntables about 1.5 inches in diameter on a side opposite the crank that were also geared to the turntable. The mini-turntables had half-inch tall posts that could be positioned at any of 8 different points on the mini-turntables. One of the mini-turntables could be relocated; there was a lever that reached across underneath that allowed you to move it to vary the distance between the 2 mini-turntables. Finally, there was a two-armed pencil holder. Each arm was about 6 or 7 inches long had 15 or twenty holes along its length. You'd put each arm on one of the posts of the mini-turntables, and a pre-cut round piece of paper on the center large turntable. The paper had 3 notches to align with tiny arms at the edge of the turntable, so the paper would turn with the turntable instead of sliding. With the pencil sitting on the paper, you began turning the crank, and all the turntables would turn, pushing the pencil's arms across the paper in all kinds of loops and swirls, etc. that varied depending on all these components -- which holes along the pencil arms were chosen to set down over the posts, which positions the posts were set at on the mini-turntables, how far apart the mini-turntables were separated. "I remeber being enthralled with my Spirograph set. I think I must have had one of the fist sets as I was very young at the time; maybe seven or eight years old. I use to spend hours and hours engrossed inmaking the designs appear as if by magic.Any hopes I had of developing an artistic bent from ny Spirograph experiences were very short-lived: I cannot draw or paint to save my life! I have no idea after all this time ehat happened to my original set; it has been lost in the mists of time. yesterday, though, I was transported back to my childhood when I was lucky enough to purchase at a local auction an ORIGINAL SPIROGRAPH SET just like the one I had as a kid! Excited? You bet I am! "Does anyone know if Denys Fisher is still alive and has there been a Biograpy done on him? "My daughter recently bought a used Spirograph set, which seemed complete but is missing the holder. I wish I had an image of this holder, or some idea on how to improvise one. Any suggestions?